DESCRIPTION : Barbegazi. One of a series of illustrations of lesser known mythical creatures. 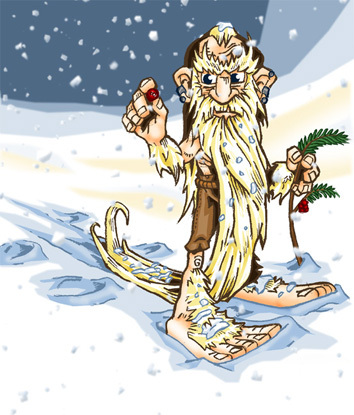 If you are a shepherd in the Swiss Alps, and find yourself approached by a white bearded gnome with large feet, do not be alarmed. It is merely the shy, yet helpful Barbegazi. In fact, if you have any lost sheep or goats, he may even try to help you locate them. The Barbegazi are often also referred to as "Frozen Beard" because of their long beard which drags behind them in the snow. In addition, the Barbegazi never come down from their icy mountain-top homes and will even go into hibernation if the weather becomes too warm for their liking; only to awaken again at the first snowfall.